Ines Beilke-Voigt is a habilitated prehistorian and outside lecturer at the Chair of Primeval and Early History at the Humboldt-Universität zu Berlin. Her research interests include cultic and sacrificial activities, funeral systems, ethnology, customs/symbolism and rock art. Since 2006, as a Heisenberg fellow of the DFG, she has been researching “Cultural-Comparative Examinations of Burial Rituals for Children in German, Provincial Roman and Italian Space” (www.Das-Kind-in-der-Roemerzeit.de). 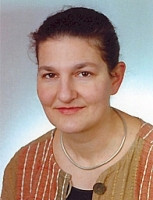 In Topoi I, she contributed to the work in Group A-I-11 with her research on Burgwall Lossow (www.Burgwall-Lossow.de). In Topoi II, she is member of the research group (A-6) Economic Space. Siedlungsbestattungen. Ein Phänomen oder gängige Bestattungspraxis? Ausnahme oder Regel?